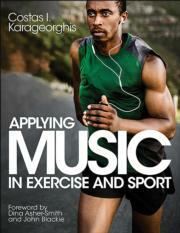 Music is used in three main ways within sport and exercise: synchronous, asynchronous, and pre-task. The synchronous application of music is typified by the use of the rhythmic, or temporal, aspects of music as a type of metronome that regulates movement patterns. Over the last decade, advances in underwater MP3 technology have led to the popularization of music use in swimming. This sport demands a regular motor pattern and highly rhythmic limb movements and breathing patterns. To overcome the almost overwhelming array of potentially negative external forces that inhibit progress toward their goals, people require tight routines, considerable self-discipline, and regular social support. Music can play a critical role by forming part of a routine and creating a mind-set associated with exercise and physical activity. Circuit training has grown considerably in popularity recently because it is an intense workout that can deliver relatively fast results in anaerobic endurance, muscle tone, and cardiorespiratory fitness. Applying Music in Exercise and Sport combines contemporary research, evidence-based practice, and specific recommendations to help exercise and sport professionals, researchers, coaches, students, and enthusiasts use music to enhance physical activity enjoyment, motivation, and performance.